Follow our moss removal tips to restore your hardscaping to its natural beauty. Patio pavers lend a distinct look to patios. You put energy, money, and love into your patios and hardscaping, so doing what you can to upkeep their look and functionality with hardscaping maintenance is invaluable. Unfortunately, moss can creep up on your patio pavers and hardscaping, obscuring their beautiful look. If you want to learn how to remove moss from your patio pavers and hardscaping, you have come to the right place. Here are some moss removal tricks to keep your property moss free. Did you know that moss does not grow in sunny locations? Trimming on any trees or shrubs which may be casting shade on the area will help deter mold growth. You can also use a pressure washer, scrub away the moss with a scrub brush and water, or use a solution of equal parts water and chlorine annually to aid with moss removal on your patio pavers. Some moss can be removed with a spray bottle of bleach and a scrub brush, however some is far more stubborn. If you find yourself dealing with persistent moss during your hardscaping maintenance, you can purchase specific chemical solutions designed to get rid of moss. Make sure that any children or pets are far away from the area while you are using toxic chemicals. You can also use a scrub brush or a pressure washer to perform this aspect of hardscaping maintenance. 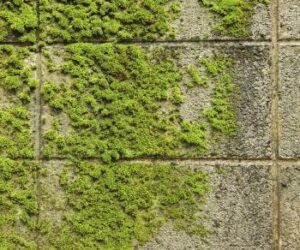 You can use a mixture of equal parts bleach and water or vinegar and water for effective moss removal on brick structures. Put this mixture in a spray bottle. While bleach is more effective at moss removal, some choose vinegar because it is a non toxic option. Spray a generous layer of the mixture onto the brick and let it sit for 15-20 minutes before scrubbing it away. This entry was posted on Friday, April 29th, 2016	at 1:51 pm	and is filed under Blog, Home Repair	. You can follow any responses to this entry through the RSS 2.0	feed. Both comments and pings are currently closed.